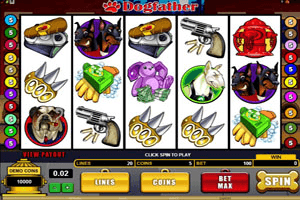 Every world has its own underworld that is filled with criminals, the same goes with dogs as you can see in this 20 paylined video slot machine. It is themed around the underworld and the mafia world of the dogs, this is why it is conveniently named the Dog Father, which is a derived from the God Father, which is one of the greatest mafia movies to be ever made. Play The Dogfather Slot here. This is why players will see that all of the symbols are inspired by the criminal dogs. These symbols include a switch blade, a bunny with stacks of money, golden coins, a dog enforcer, the dog father himself, two bully dogs, a revolver with bullets, a fire hydrant and more. These symbols will start spinning on the game’s reels as soon as players spin the reels after they place their wanted bets. They can place the bets by choosing the number of lines, the amount of the coins and their value. Apart from forming winning combos to earn line payouts, there are special symbols. There is the yellow dog symbol that acts as a scatter symbol that gives out great rewards as well as triggering 13 free spins. All winnings during the free spins are tripled. Apart from the scatter symbol, there is the wild icon that can replace other icons, this wild icon is the Dog Father. The last special symbol is the Fire Hydrant which can trigger the bonus round of the game, the Mark Your Territory Bonus.